July had been a busy month. Between planning a move back to the UK and finishing up with work there hadn’t been much by the way of relaxation and there were still a few things left on the ‘to do list’. With boxes packed and vans booked I had managed to sneak a small window of three days before the move happened. 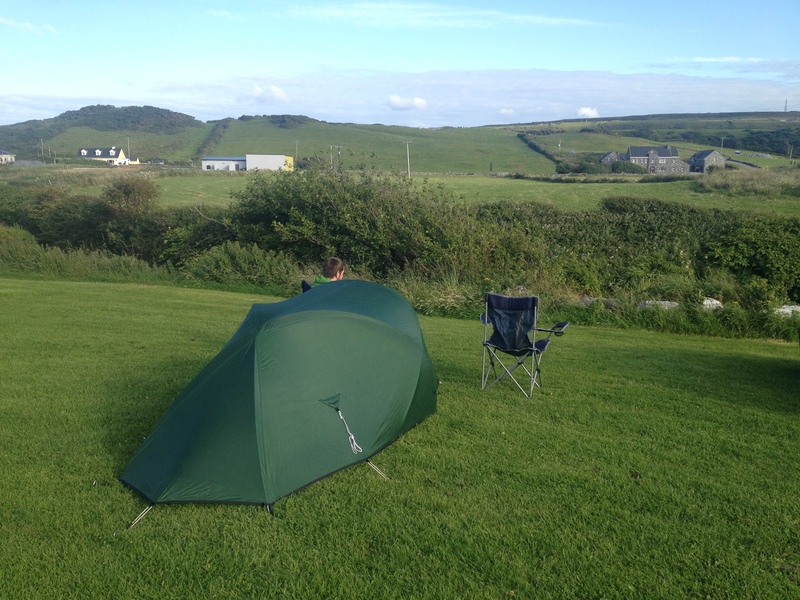 It was July; I hadn’t been on holiday and I was in need of fitting in a Microadventure to stay on track with the challenge. 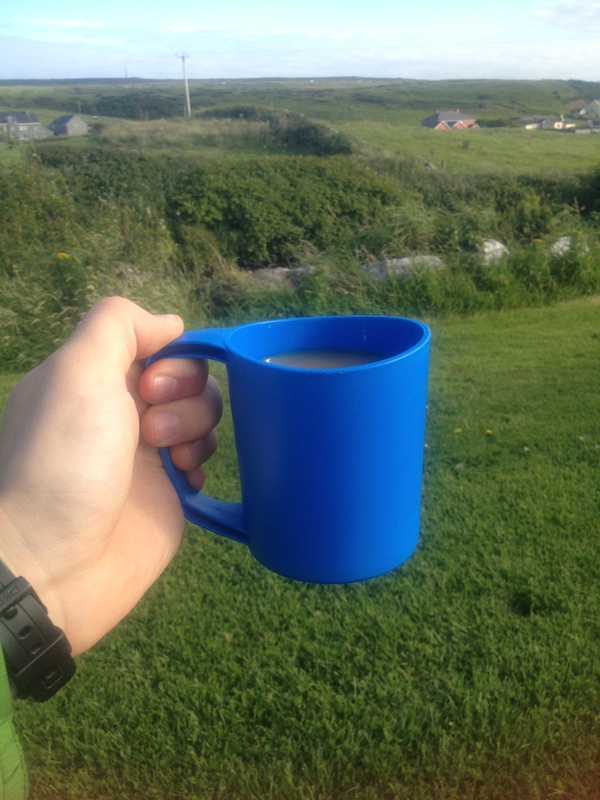 During my time in Ireland my exploration of the West Coast had been limited to a day out in Galway and June’s Microadventure to Connemara. All year I had been hearing stories and recommendations so the decision was simple; it was time to go. By this stage Katie and I had become masters of packing our small car and in no time at all we were on our way. A few hours later and a slight detour to see and old church we arrived in Doolin. Doolin was to be our home for the next three days. We found a wonderful quiet corner on a campsite near a stream and began to settle in. I’ve never really been one for campsites and the towering shadows of motor homes and caravans that seemed to carry more possessions than my house dwarfed our small mountain tent and stove. On the plus side we had found our camping chairs under the stairs, I hadn’t left them in the UK as I had thought all year, and I had a new cup. Therefore I was happy. By now I have become fairly creative with camp cooking and set about cooking my one pot favorite of bacon and chickpeas. As I tucked into my hearty meal and thought about going to bed I felt the most relaxed I had in weeks. Time spent sleeping outdoors was working its wonders on me again. The next day we awoke bright and early feeling refreshed and ready for a day of exploring. Despite the odd complaint about how small the tent was Katie was making great progress at living in such a small space and a simple breakfast of sausages and beans was soon being consumed. Our main attraction for the trip was to see a wonderful and impressive display of nature that we had been told about more times than I could remember since arriving in Ireland. 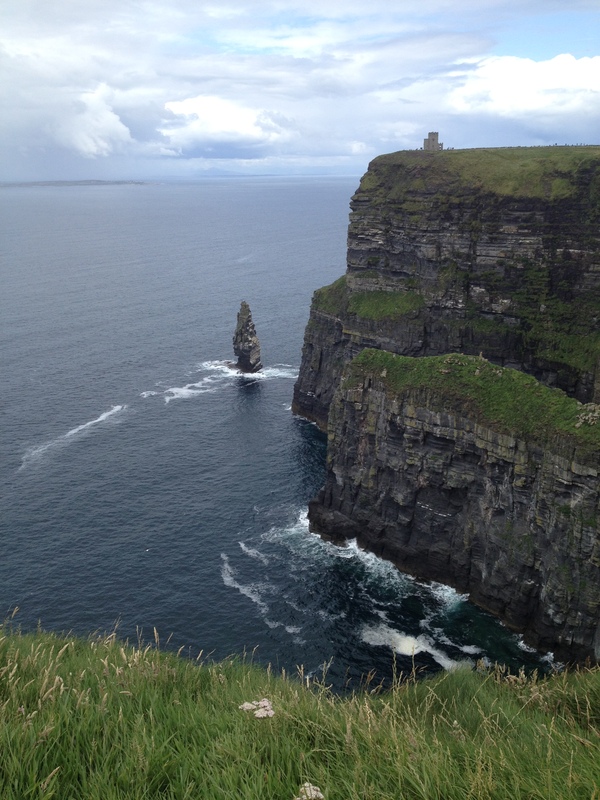 The Cliffs of Moher are 214 meters high and home to many sea birds and powerful rock formations. Upon arrival we had to wade through the usual queues of bus tours and holiday makers and after skimming over the visitor center to due its huge population of people we began exploring the cliffs. It was wonderful to walk along the cliff tops and see the many sea birds nesting and flying below. It was as we headed north along the cliff tops I began to feel really impressed with the view that met me. I am often disappointed when visiting such places due there lack of authentic nature and the effect of tourism and popularity. I like to be able to experience and touch the natural wonders that I see, to place my hand in a mountain stream or to feel the cold hard texture of rocks as I scramble upon them. I prefer to have worked hard to have an individual and authentic experience with nature rather than just role up in a car and join a queue. We spent time talking and laughing, sitting on the edge, a childlike sense of exhilaration and slight nerves due to the vast drop below. As I rounded the corner and walked over the cliffs I found the part of the cliffs I had been waiting for. Unspoilt, unfenced access to the cliff tops where I could begin to explore and experience the cliffs without restraint, having to rely on my own wisdom and sense for safety instead of a barrier and a warning sign. The views were wonderful and the sea a beautiful blend of blue and green. It was hard to know where the sky and the sea joined and the height and exposure were a mixture of exciting, intimidating and impressive all at the same time. We spent time talking and laughing, sitting on the edge, a childlike sense of exhilaration and slight nerves due to the vast drop below. We tried to capture some photos on our phones but the combination of the wind and the fear of dropping them made things hard. After a while we walked back smiling, in a place full of tourists and coach trips we had found our own small adventure, shared with just the two of us and the cliffs. 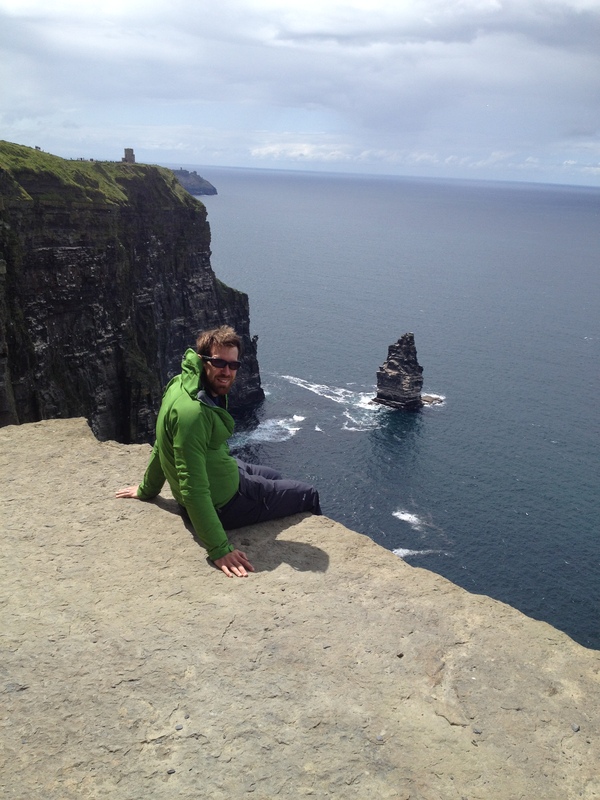 Others were nearby and had clearly had there own adventure, experienced the same cliffs in a similar way. On a deeper level though they had not felt what I had and neither had I known their feelings and experiences either. 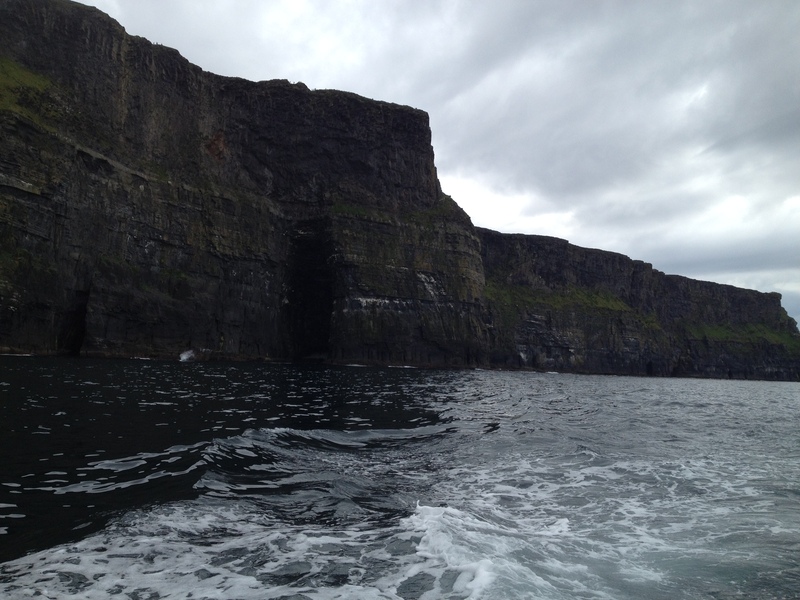 This wonder and joy of exploring an unknown environment was completed the next day as we took a boat trip around the bottom of the cliffs and again saw the magnitude and towering height of the bands of rock stacked one upon another. Camping continued to be fun. We walked more, we talked more than we usually would and we enjoyed ourselves. We slept well and made the most of the good weather. 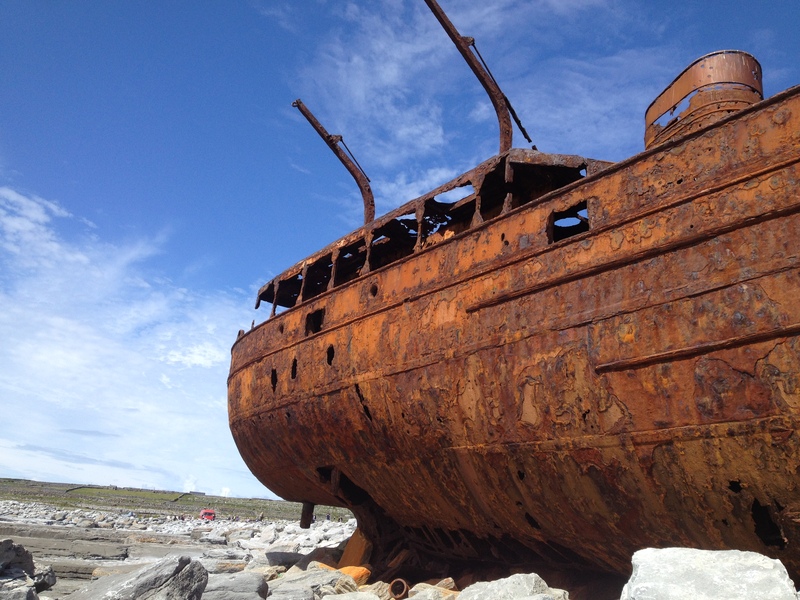 We visited islands, found a ship wreck and rode bicycles along deserted roads. We cooked outside, we ate outside, we slept under two thin sheets of material. It was the perfect way to finish our time in Ireland. Did we complete our ‘to do list’ for all we wanted in a year in Ireland? No. Have we seen enough to excite us to come back and explore further? Of course. It had been a delightful year of living in a city and exploring the countryside as and when we could. During this time Microadventures have given me two things. Firstly they have brought the escapism from a busy life that I so dearly need. They had encouraged and at times forced me to make plans and stick to them, to research and to plan. They had also given me an exciting excuse to travel further afield and to see more of the country in which I was living. Most of all they helped me to have fun at times when other areas of life were not, and they had brought a sense of excitement that I have much enjoyed. Three days later I was stood back in my living room surrounded by a large stack of boxes containing our home. I felt calm, I felt refreshed and I felt ready for the challenge of a new chapter. Would I have felt the same if I hadn’t made time for the trip? I guess we will never know. I’m glad I did however, and I shall continue to seek out time to relax and explore as a part of a busy modern day lifestyle, if for no other reason than that I enjoy it!